When you live at Cadence, you join a community of convenience. Schools, shops and restaurants? Right around the corner. Parks, pools and trails? Practically in your backyard. 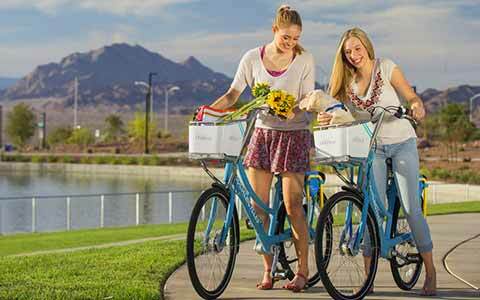 Amenities like bike sharing and free Wi-Fi? Do you even have to ask? No matter your lifestyle, interest, or need, we've got you covered. Our amenities really speak for themselves, but they’re so great we’re going to talk about them anyway. Certainly our biggest amenity, our 50-acre Central Park is perfect for walking and biking, and complete with free wifi so you can stay connected. For more outdoor fun, check out the splash pads, pool, adventure park, and trails. There’s also a dog park for Fido and a free bike share program for you. If you feel like getting out of Cadence, Lake Las Vegas, Galleria Mall, The District, and Cowabunga Water Park are right nearby. Cadence is home to two splash pads, one near the children’s play area and one in the Pool Complex that’s a whopping 2,000 square feet in size. And, yes, they’re as fun as they sound. Pedal around Cadence free of charge when you join the bike share program. To get started, create an account. You’ll receive an account number and PIN that you can enter on the back of any bike to unlock it. Bikes can be checked out of and returned to any hub in Cadence. Central Park is a 50-acre expanse of turf areas, an amphitheater, pickleball courts, children play areas, six-lane lap pool, 2,000 square-foot splash pad, and free wifi and outlets to keep you connected. With more than 450 acres of open space, Cadence makes it easy to get out and get active. Take a stroll through our parks and trails, like the 50-acre central park, complete with free Wi-Fi so you can stay connected. You can also pedal around in style thanks to our bike share program and help Fido keep his figure with visits to the dog park. 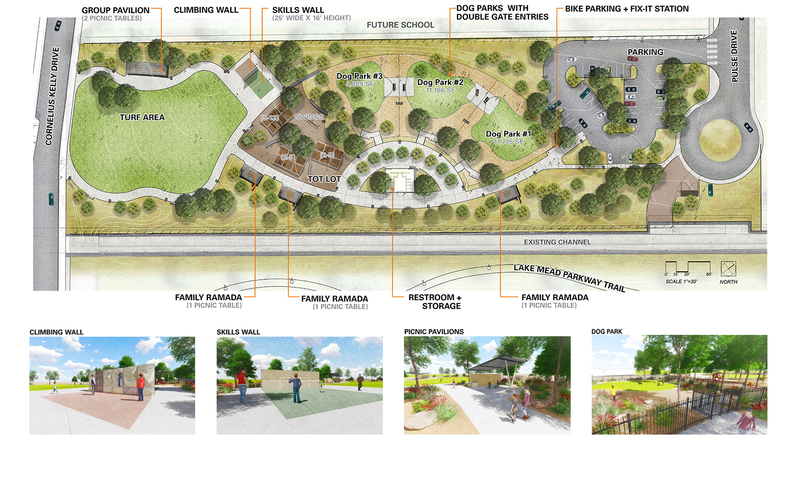 This 5-acre park is home to a children’s play area, plenty of open space, and a special area for all your K-9 friends. Scattered throughout Cadence, these areas are perfect for when you just want to get out of the house and enjoy the outdoors. Completed in 2012, this 34-mile long trail serves up everything the Mojave Desert has to offer. Hikers and cyclists can take advantage of the 12-foot wide paved path, and if you’re riding horseback there are secondary equestrian paths in certain parts of the trail. Wind your way through 13 miles of residential and desert landscapes, bridges and dry riverbeds along the Las Vegas Wash, with plenty of drinking fountains and shaded areas along the way. Designated as a National Historic Trail, Lake Mead Trail is truly unique. Walk or bike along the elevated railroad through expansive tunnels all the way to the Hoover Dam. Your kids are about to get schooled - at one of the standout schools right near Cadence. Quality education options are important, so at Cadence you'll have your choice of nearby public and private schools. The oldest K-12 school in Henderson, Mrs. Sue Blakeley and her staff continue to instill their mission and core values in every child at this stellar private school. 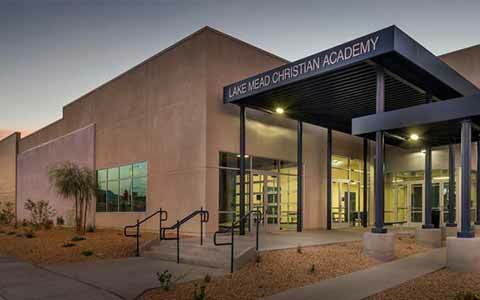 This public choice, tuition-free charter school uses proven learning methods and strategies to provide an unmatched education for K-12 students in Henderson. This public choice, tuition-free charter school uses and academic model focused on accelerated, back-to-basics style for K-8 students.